The boys about to depart for Pamplona. It is amazing what fear can do to a man. Fear can force you to perform feats that were previously thought impossible. Fear can drive you to keep going when all seems lost and hopeless. Fear, it turns out, can take a man from a drunken stupor to dead sober in a matter of seconds. Let me set the scene. It is a brisk July morning on the cobblestone streets of Pamplona. It is raining just enough to make the road slippery but not enough to soak the waiting crowd through. What had seemed like a bit of fun suddenly became a reality as the old priest looked me in the eye as he blessed the crowd. A silence fell over the nervous throng as the devout fell into prayer. 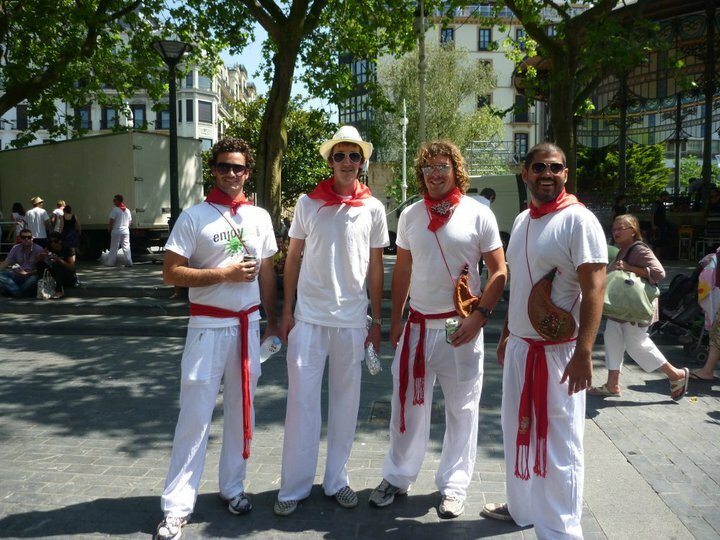 The previous afternoon, I had boarded a bus from my home in San Sebastian with three friends, destined for the festivities of San Fermin. 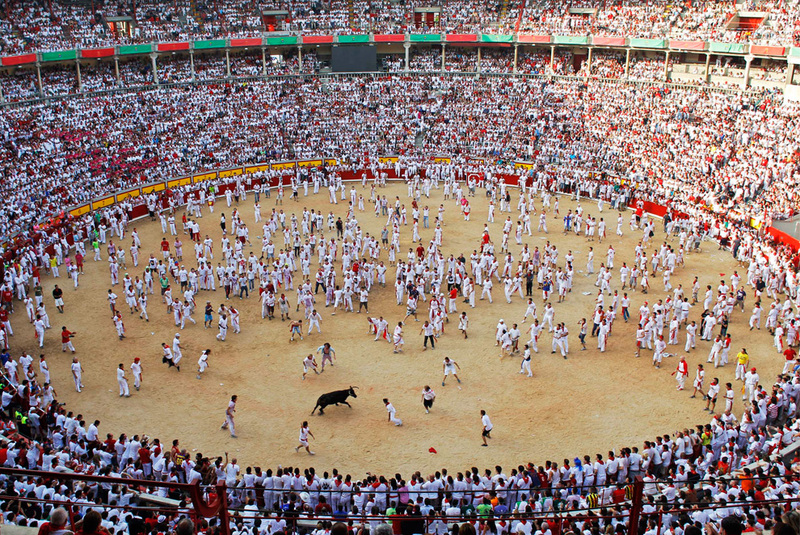 Arriving in the city centre, we each bought a litre of sangria and made our way to the Plaza de Toros de Pamplona. I had never been to a bullfight before, and I didn’t really agree with the slaughter of these majestic animals that didn’t seem to really have a chance of winning the “fight”, but my number one rule when travelling is to experience as much of another culture as possible. And in Spain, bullfighting is right up there so I was in. We found ourselves in the upper tiers of the arena, sweating beneath the tin roof among a cloud of cigar smoke that rose gracefully from the group of old men two rows in front. Three hours and another litre of sangria later, the bullfights were over and the champion Matador, Joselleo, stood over the slaughtered creature, bowing before the frantic crowd as roses poured down upon him. What happened over the next 12 hours is half a blur – though I do remember my friend being hit in the head with a skyrocket as it exploded, and half not suitable to be translated into the written word so I will skip ahead to the morning after. The plan had been to find a room, get a few hours sleep, sober up and have a hearty breakfast before making our way to the bull run. This seemed the sensible thing to do and was what I had promised my better half, who was not all that impressed with my participation in the first place. While the plan sounded good, as is the case with most things in life it did not come into fruition. In what seemed like no time at all, it was 7:30am, we were finishing our last drinks and the Plaza del Castillo Pamplona was emptying as the runners and spectators alike made their way to the course. Once the official blessing had taken place, a local man explained to me that the best spot to start the run is at the top of the initial rise as the bulls would be a bit slower after they run up the hill. He told me that I will hear a rocket being fired to let the crowd know that the bulls were out and running. 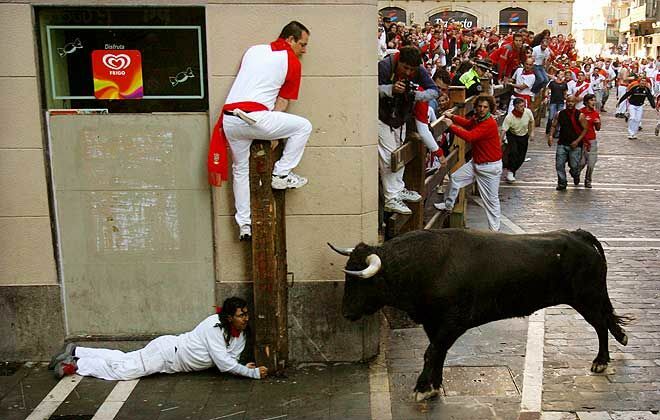 “Don’t start running straight away”, he said “the aim is to run with the bulls”. The locals went about their stretching and limbering exercises as it dawned on me what was about to happen. A cold sweat had consumed my body, my mouth was dry and my palms were clammy. I turned to my mate and we devised a plan. The only way to get through this, we decided, was to stick together. As the final pieces of the plan were falling into place, an almighty boom filled the morning sky. Jesus. Why didn’t I pray with everyone else?! To my surprise, everyone just stood, looking down the hill. Waiting. What happened next took less than a minute, but it felt like a life time. I could hear the rumble before I could feel the tremor of the ancient cobblestones beneath my feet. The crowd began to rush towards me in what appeared to be a wave of frantic bodies. As the first beast came into sight, I remember feeling surprised at how big it was. As the second and third bull approached I turned and ran. The plan had gone out the window. It was every man for themself. Fear had made its way into my mind and it flowed through me with each chest shattering beat of my heart. One thing I learnt on that morning is that a 650 kg bull can outrun a human. The first beast cruised past me as I turned to see where my friend was. It turns out he was right behind me and as we locked eyes I could see that he was just as scared as I was. That look turned to sheer terror only seconds later as he slipped on a cobblestone and disappeared from sight. As those behind jumped over him, instinct took over and I once again turned and ran as the remaining bulls approached. It was survival at any cost. With the infamous “Dead Man’s Corner” getting closer with every step, I struggled to navigate the congestion and decided to cram into the boarded up doorway of a shop. As others followed my lead, it became a battle of survival as instinct again took over as each of us tried to push the other out of the way. 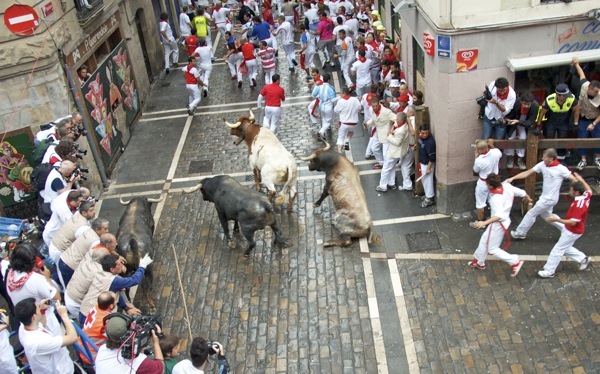 Luckily, the bulls did not stop to witness our display of humanity at its worst. If they had, I am sure they would have chuckled to themselves just before putting their head down and tearing us apart. As the last bull ran past, the doorway emptied and we exchanged sheepish looks at the fact that each of us would have sacrificed the other had it come down to it. I ran the remainder of the course with a sense of relief and followed the beasts into the arena where they were quickly corralled away for that afternoon’s bullfight. I had made it, only just.